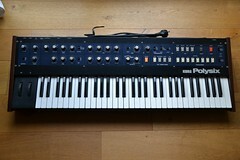 So i got this dead KORG POLYSIX from a friends friend. It sat in the box for the last 20 years, and just recently he brought it out and plugged it in. Just strange tones, nothing else. He decided to sell it broken for little more than the proce of the SSM ICs. Now i am trying to restore this beauty. Below you will find my blog for this journey. I owe special thanks to Ko Okatake from Modeless Factory/Japan, who more than once kindly pointed me in the right direction, and Scott Rider aka Old Crow, who uploaded a nice tutorial about the crucial battery replacement. As I've been told the former owner bought it exactly 30 years ago in 1986, used it for about 10 years, and then stored it away for 20 years. Just recently he plugged it in for the first time after 20 years and all he heard was some strange noises, he said. I suspected a battery leakage. Now here she is. And the first look gave me a sense of foreboding: heavily oxidized screws, some rust blisters here and there... My fear was that the acid of the battery leakage might have wreaked it's havoc for years, destroying the KLM-367 memory/controller PCB beyond repair. Anyways, on the first day I had no time to open it up and take a closer look. After opening the unit I was more than just relieved. 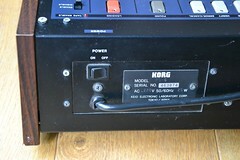 The battery installed still showed no signs of leakage. So I powered the synth up. Yes, no proper sounds, but this was what I expected anyways. I quickly recognized that I could program a new sound, all controls of the sound engine obviously still worked. A few keys of the keybed where not working. Another thing I expected. However, the unit is totally out of tune and needs a complete calibration procedure, I guess. Nevertheless I stopped any testing here, leaving the memory functions alone. I wanted to install a new CR2032 battery first. Now I took a closer look at the KLM-367 and quickly saw that someone must have been done a leakage repair at some point. Most probably long time ago, since they installed another old NI-cad battery again...Anyway, I saw that the AND gates near the battery have been replaced and socketed, and the solder stopmask was dull. Obviously they had removed the acid from the battery leakage only on the surface, and meanwhile the acid did some damage to a few traces. But i think the damage is not too bad, as you can see in the picture below. I spotted one affected trace near the AND gates (IC31), and the wide GND trace has been affected on two spots. Doable, so the board will not have to be replaced. 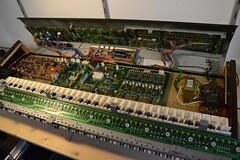 Meanwhile I extracted the KLM-367 board and removed the old battery. 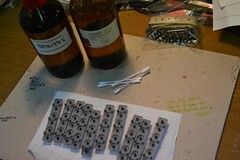 A more thoroughly examination of the traces revealed that previous repair has not been sufficient. 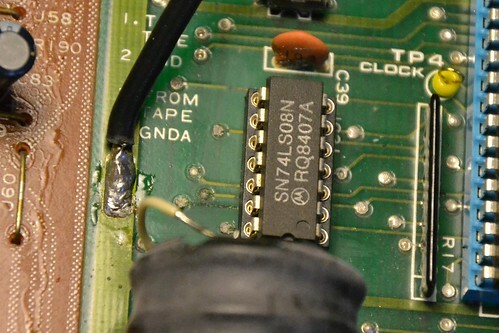 They obviously just cleaned the PCB on the surface and replaced one trace underneath the IC31 (AND gates) by a wire. So the acid of the battery leakage continued destroying some traces and vias. 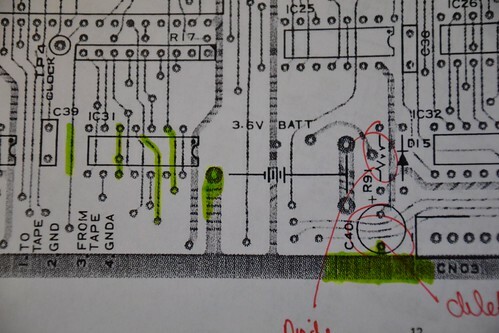 I marked all affected traces on the PCB printout. To remove and replace all bad traces it would be the best to remove the socket of IC31 completely.Something i actually wanted to avoid, since this would be the 2nd desoldering action on this footprint - and each PCB has it's limits (and me too)... on the other hand I don't want the acid to degrade the PCB any more. One solution could be to cut the bad traces, but not remove them. This way the acid cannot crawl any further and I would most probably not have to desolder the IC socket. Additionally I cleaned the panel with some isoprop and removed all the knobs for washing them up. 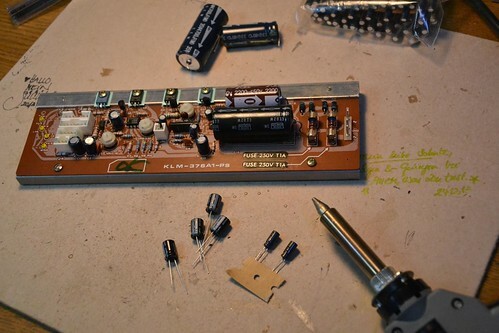 Today I cut and bypassed all polluted and corrupted traces/vias, and i installed a new CR2032 3V battery. 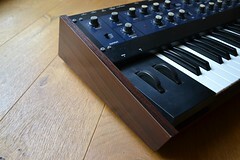 The KLM-367 is in the synth again, and works as expected. 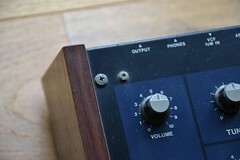 So far I just tested the programming and recalling of a sound, even after powering off. All good! Hurray! Thank you, Scott Rider aka oldcrow! Day 6: Optoelectronics - Out of Tune or Out of Scale? Ko Okatake of modelessfactory/Japan pointed me to the P1501 optocoupler, which will most likely be the cause for the wrong scale. I just ordered a NOS replacement part from Australia - so now i have plenty of time to disassemble the keybed and clean the contacts. Now the KLM-366 is on the bench. 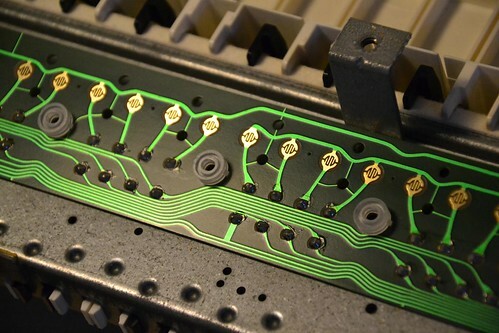 Stefan Hübner has some good info on the opto coupler in the Polysix' Antilog circuit. 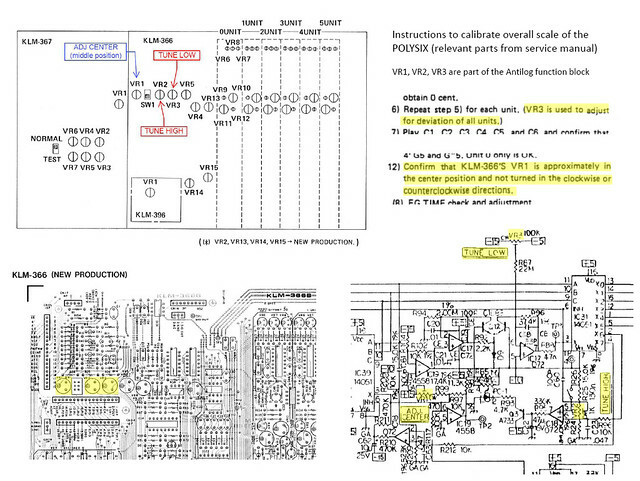 And thanks to his article I am almost 100% sure that the scale issue is caused by an error in the Antilog circuitry. I measured -13V at pin 7 of IC 18, indicating that something is not working as expected here. While I am waiting for some replacement parts I started to replace the old electrolytic caps and the actual regulator IC of the PSU. The new opto arrived yesterday. Since everything was prepared already (socket installed) i just had to put the new opto in it`s socket - and now the POLYSIX is purring like a cat again!